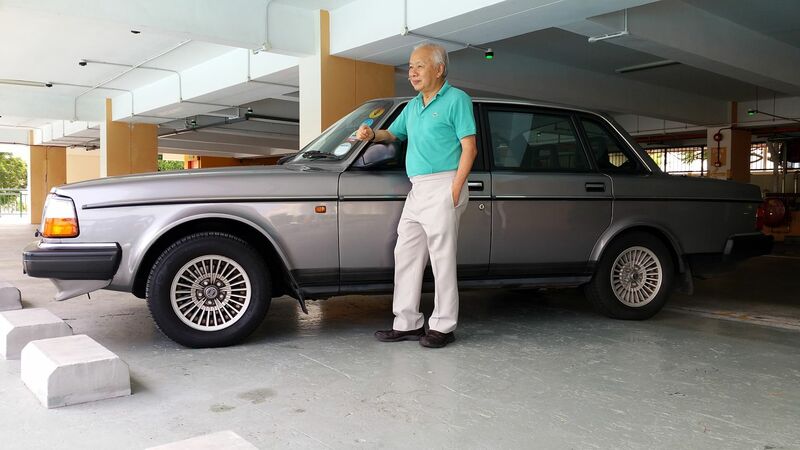 Retired traffic engineer Joseph Yee says he has held onto his Volvo 240GLE for 25 years because he abhors paying additional taxes. "I don't like paying more taxes than I have to," he says. The 72-year-old former group director of the Land Transport Authority paid $105,000 for the 2litre four-speed automatic Swedish sedan in 1991. He revalidated its certificate of entitlement in 2001 for $26,000 and again in 2009 for $3,004. COE revalidation costs far less than buying a new car, which comes with multiple taxes amounting to more than twice the value of the vehicle itself. This is also why Mr Yee says he feels uneasy about the current car-lite rhetoric, which he suspects could result in motorists being "squeezed more". "I am already car-lite," says the fit-looking retiree who walks 4km a day. His Volvo, which he maintains well (he uses only synthetic engine oil and washes the car every day), has clocked only 250,000km in 25 years. That translates to 10,000km a year or around half the average annual mileage of cars here. The car was maintained by the authorised agent during the first 10 years. After that, he has been sending it to various workshops that specialise in Volvos. He also sources spare parts from a stockist in Petaling Jaya, Malaysia, which keeps parts for old cars. Mr Yee says the car has been largely trouble-free. "It still runs well," he says. "And I've never even overhauled the engine." But the air-conditioner unit "died in the first year" and the power steering unit leaked once. He also changed wear-and-tear parts of the suspension such as dampers and bushes - only once - and, recently, he changed the bolts on the wheels. One major incident was when the fuel pump conked out when the car was just two months old, causing the engine, brakes and power steering to fail all at once. "It was a Saturday afternoon along the ECP and traffic was quite light," he says, adding that that was why he was able to limp to the side safely. It failed two more times after that incident and the glitch was traced to a switch. He has since installed a bypass switch, but has never had to use it. The Perak-born veteran planner has owned only three other cars: They include a Mini Cooper, which he bought in 1969 not long after earning a civil engineering degree from the University of Malaya. Between that and his current Volvo 240, he had a Volvo 144 and a Volvo 244. The 240 was his only brand-new car. "I had a promotion and decided to give myself a treat," Mr Yee recalls. He still keeps busy, working three days a week as a consultant on various projects. Work aside, he says he spends time with his wife, Lily, a retired medical doctor. They have a grown-up son. "We go for lunches and meditation classes and she has her own activities," he says. "I drive her around, as husbands do." They met when he first came to Singapore to work. She was a sister of a friend with whom he shared a room. Few motorists know it, but Mr Yee had a hand in planning and designing most of the expressways here. He was also involved in the early planning for Singapore's MRT system as well as the area-licensing scheme (the predecessor of Electronic Road Pricing). He worked on the scheme soon after he obtained a postgraduate degree on transport from Imperial College London in 1971. He also helped draft the Building Control Act after the 1986 Hotel New World collapse. Asked what he would do when his car's current COE expires in 2019, he says he would "probably revalidate the COE again" before adding wryly: "But I'm getting old too."